Hundreds of traders, wholesalers, and manufacturers of plastic products came out in protest against the recent plastic ban in Bengaluru. 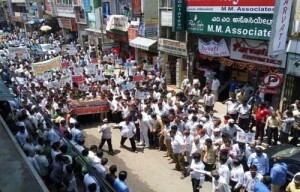 The protesters – under the banner of Karnataka State Plastics Association – took out a rally between K.R. Market and K.G. Road, choking traffic headed towards the busy Kempegowda Bus Stand. The association demanded a roll back on the ban of plastic products, including containers, spoons, bags, among others, which has been implemented since Friday. The association claimed over 75,000 employees will be affected by the ban. They have also moved the Karnataka High Court against the ban. The ban, when enforced in full, is expected to significantly reduce the quantum of plastic waste generated in the city. However, companies claim over 350 manufacturing industries, will be affected adversely by the ban.